You could be partying like a King if you land the £30,000 jackpot prize available on this fun scratch card game from Jackpot Joy. 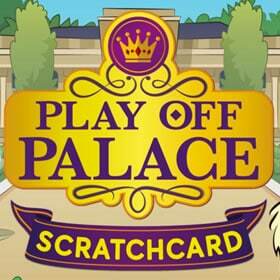 The ‘Play Off Palace’ game gives the player a choice of 6 different scratch cards. Each with its own jackpot and purchase cost. The lowest cost card is called ‘Give a Dog a Bonus’, this comes with a price tag of 20p per play. The jackpot for this entry-level card is £200, so you won’t be buying a palace with that! However, the highest priced card (£5) ‘Play Off Palace Supermatch’ does offer you a chance to live like a king with a £30,000 top prize. The gameplay on ‘Play Off Palace’ is slick and fun. The card has a royal theme and the graphics on them include a lovable little Corgi. Bruce the Corgi is presumably is one of the Queens much loved royal pooches? I hope Jackpot Joy is paying Her Majesty a licensing fee! Each of the six different cards has a cartoon feel to it. The design is well crafted and the games are easy to understand and play. The first card ‘Give a Dog a Bonus’ is a basic 5-panel scratch-off game which requires the player to match 3 amounts to win. The second card ‘Bruce’s Treasure’ is a 2-panel card. 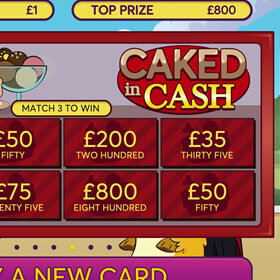 In the first panel, the player must match 3 symbols to win, you also have a bonus game which could award a cash bonus. The most interesting card is ‘Play Off Palace Supermatch’ this card contains 3 games in 1. You must scratch the first panel to reveal numbered balls, match 3 to win the cash amount. The second panel asks you to reveal a ‘winning’ symbol. If you can match your symbol to one in the lower box, you win. Panel 3 is a simple match 3 amounts to claim that cash. Overall, I enjoyed the scratch card. Although, I would add there is nothing ground-breaking about it. What we have here is a well-produced scratch card from one of the best providers online. 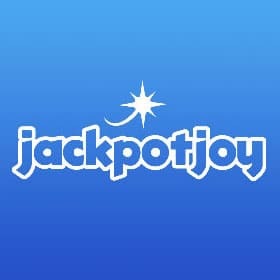 Jackpot Joy has a great reputation and is a firm favourite with online players in the United Kingdom. You can sign-up with them today and claim an excellent welcome bonus. Once registered with JJP you can play all their scratch card games in demo mode before risking real money.